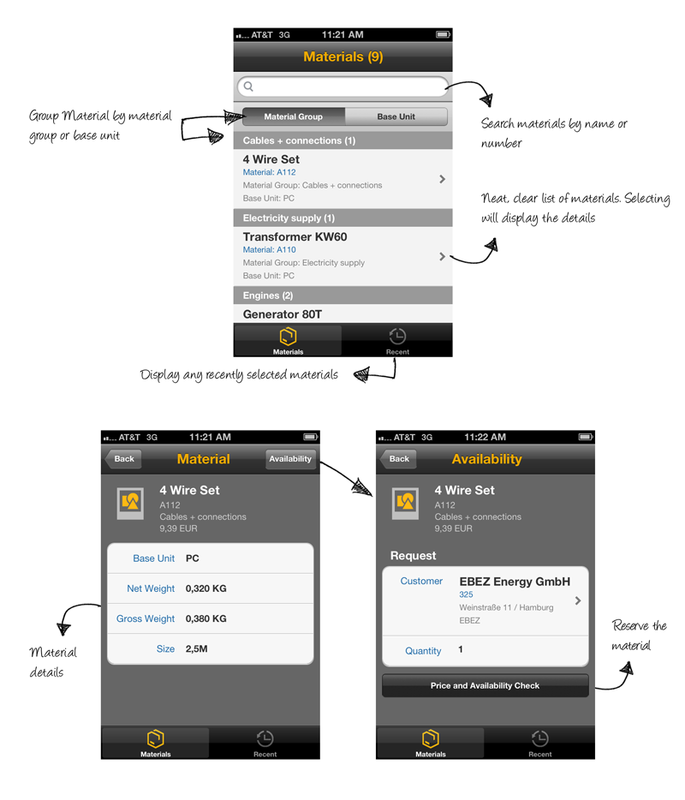 With the SAP Material Availability mobile app for iPhone, you can display material details including a product image. It allows you to check on customer specific pricing and product availability. Now you can also make reservation directly from your mobile device anywhere and anytime. Material availability is a staple part of any ERP and having an app which has the ability to view pricing, stock on hand and reserve stock from a mobile device is valuable. The app is very straight forward and pleasantly basic, it allows you to filter your list of materials as well as group them by material group or base unit of measure. Selecting the “Availability” button will allow you to lookup and specify a customer and quantity, then displaying an estimated delivery date, delivery plant and total price. Once you confirm the displayed details you can make or cancel the reservation. I liked the fact the app offered the ability to use sample data as this makes it easy to evaluate and decide if you feel it is worth pursuing further. The material images are a nice additional too, I believe it would be beneficial if you could click the image and have a larger view of the product. As mentioned, the app is simple to use, quick and easy to navigate – The premise for any mobile application. However, one item I felt the app lacked was the ability to see existing reservations for the customer/material. If anyone out there is using this app in production, I am curious to know how the images are loaded/stored and then subsequently referenced? In DMS?